With a dual-action agitator and Deep Fill water level option, this traditional top-load washer lets you do laundry your way. The stainless steel tub won’t chip, rust, or snag to protect your clothes. We have used the machine and are satisfied (so far) with the quality of its performance. However, the noise that is being experienced sounds like a bearing is bad, or perhaps there is some kind of scraping. It is rhythmic and associated with the agitation cycle(s). The machine was just installed earlier today. The noise (one person says) sounds like a large animal in its death throes. Seriously, we need to have this addressed because this noise is beyond reasonableness. We did have a Profile Prodigy which never made any such noises (it quit after long years of good service). There is also a vibration (especially on spin cycle) which we believe to be beyond normal limits. I'm having the same problem and just got off the phone with customer service. They said that the noise is a normal motor noise but it shouldn't be heard from about 5 yards away (you can hear this outside the house). She said this is not normal and my next step is to return it for a new one. You would think after 3 years of this complaint that they would have fixed the problem though. Haven't seen this machine yet, but if it's like my old one you can fool it into thinking the lid is locked. I just stick a flathead screwdriver into the slot where the lid locks into the machine body and voil&agrave; it thinks it's locked, but the lid is open. I am looking for a washer that will do hot, deep water and second rinse together. Is this my washer? Don&rsquo;t buy. $150.00 extra for stainless steel tub and a deep fill that&rsquo;s only 13-14 inches. I want water to the TOP and told this will fill. I didn&rsquo;t reasech this washer so my fault in the end but I went in word on sales assistant. DOES NOT wash, clean a full set of flannel sheets. I have to soak, second rinse. Washer is only good for a bunch of handkerchiefs. I wanted an agitator but this one really stretches out the necks of all T sheets. Big regret. This is very loud. I would not recommend it if that is a concern. Also I do not believe this cleans my clothes as well as older GE models. 4.2 cu. 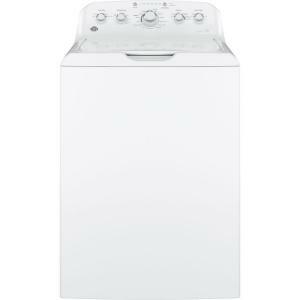 ft. High-Efficiency White Top Load Washing Machine with Stainless Steel Tub is rated 4.1 out of 5 by 10627. Rated 5 out of 5 by Judy Ledkins from We LOVE our GE Washer! We went to R C Willey's in Salt Lake City, needing a new washer and dryer. We bought a high-end Whirlpool sort-of agitator type and hated the washer, no water in the wash and you can't add water yourself. And when it spun, the hose was slamming against our wall. But mainly, no water. We exchanged for a new lower-grade Whirlpool with an agitator, and same problem, along with a seam in the drum (really, a noticeable seam that would rust over time). So we exchanged again for this GE washer and its companion dryer, AND IT'S THE BEST THING WE DID. I LOVE MY GE WASHER AND DRYER. Yay! I can select water level load. Now PLENTY of water, my clothes are getting cleaned. It even allows me to soak my clothes for 15 min or more. I love it. I set for 15 min soak, it is perfect! I love doing laundry now! It does spin hard like all new washers, but there's a clip on the back that the hose is clipped to, so no noise. LOVE TO DO LAUNDRY. THANKS GE !!!!!! Rated 4 out of 5 by Gail K from Back to the good style of washer I purchased a top load washer with the plate at the bottom in October 2016. It was supposed to save on water. This washer would fill up with just barely enough water to get my clothes wet. Even on a so called "deep fill", the clothes were not floating in water. I had to choose heavy duty load to get more water, but this choice also twisted my clothes up for a longer time. This washer would twist my clothes up so tight I had to untwist them before I could put them in the dryer. This washer would no longer spin one day in January 2019. I bought this GE top loading washer, with the tall agitator the same month and I am very happy with it. My clothes are not twisted and pulled during the cycles. I have many choices of water levels and a deep fill selection that actually works! I have more control over what I want to do with the laundry load. If I just need to have the clothes spin a second time, soak, etc. I am very pleased with this washer!!! I highly recommend this GE washer. Rated 5 out of 5 by CETH from Really Clean Clothes!!! I love that this washer (GE model #GTW460ASJ9WW) allows some control over the water level used for each load. Our former washer was totally automatic in this regard and many times we had do re-do the wash just to get it clean or rinsed thoroughly. Not so, with our new GE. It allows you to choose the water level OR gives you the option to use precise fill so that the machine just senses the size of the load. I find that with heavy loads like towels, sheets or jeans that my wash comes out clean the first time with this new washer. I also love the deep rinse option which just tells the machine to add more water in that final cycle (again great for those larger loads for a thorough rinse). It's also wonderful to have the ability to soak clothes right in the washer (something I could not do before). The only negative at all is that it is somewhat noisy - but that's a small trade off for all the other positives we've found with this machine. I paid much more for my previous washer and it never did the job this machine does. Thank you GE for offering this wonderful machine. It does a great job and was modestly priced!!! Rated 2 out of 5 by tangots from Temper mental settings/sensing It seems to clean well, however overall appearance/controls looks cheaply made. The washer will not always start once you have selected the settings and closed the lid, sometimes you have to wait and wait and reset the controls several times before it begins. Also i have new floors i installed it is very solid and level 1 1/2" of plywood but even though we carefully balance our load inside it will still get out of balance and move 6 or 7 inches sometimes. So we will have to open it and rearrange the load, this will happen about 1/3 of the time. I have had washers that cost a third of this one when new and was far superior to this one in every way. I used it for 20+ years and gave it away for what i thought was a better newer washer. I am on my third washer since then and my old one the one i gave away is still being used. It doesn't need to be fancy or digital or play music it just needs to get our clothes clean, not dance around the floor and break down, for this price i don't think we are asking too much. Rated 1 out of 5 by Halidor from Not a good product. VERY noisy. Makes a "Sawing" sound that you can hear all through the house. Has a lot of settings, but none of them seem to improve the cleaning capabilities of this product. Typically, the clothes on top of the load, never see water....even on "Deep Fill". I've pulled dry, soap cover clothes out after a wash cycle. More often than not, there is pet hair and any ground in dirt, left of the clothes after washing. One of the annoying "Features" of this machine is that if you leave the lid up too long, it will drain all the water, and soap, out, making you start the wash over. Sorry we ever bought it. Rated 3 out of 5 by gavonn0033 from I do like the ease of using this product. I diffinitely like the technology. But, only if it works. I've used this washer for 6 months so far. There is diffinitely room for improvement regarding different features. The sensing feature has trouble sensing the different water levels. Well, how are rhe clothes suppose to get clean if they are not submerged in water. This machine is noisy. 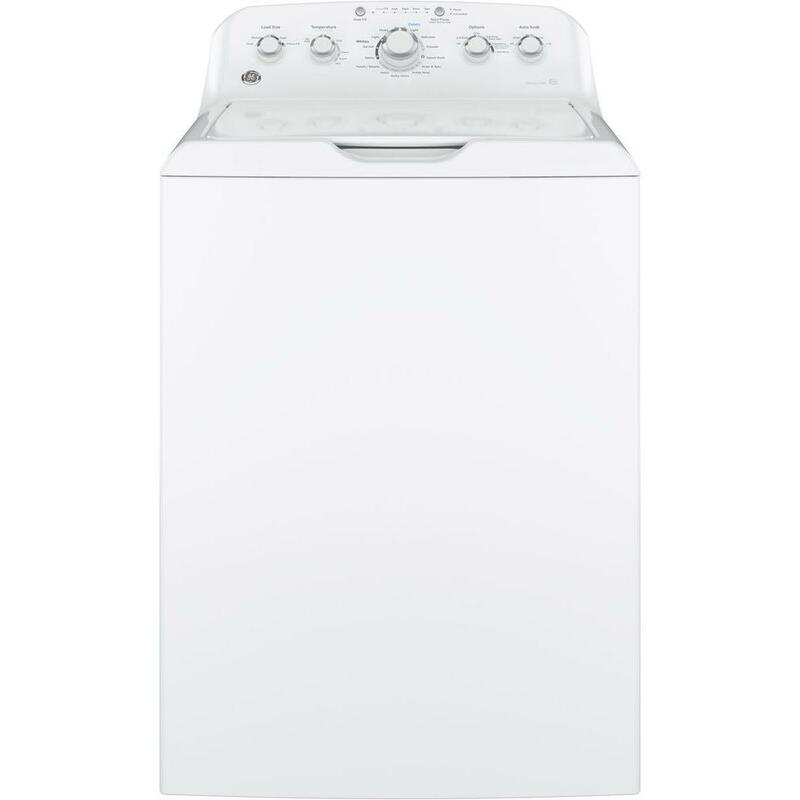 This is a large capacity washer with a sensing equalizer feature. Yet sometimes the washer will rock and walk even though when it was installed was leveled. When you wash heavier clothes like towels & jeans. And because the machine has a lid lock feature when this happens. You can't open the lid to stop this or to hand equalize the clothes. The pause feature is great if you want to add something ekse to the load. However, don't take to long. Because all your soapy water will drain out before you have a chance to hit the pause button again to continue for the clthes to wash. You end up having to add more detergent and refill with water again. There is definitely room for improvement with this washer. Rated 5 out of 5 by maddy0106 from Great machine! I've been buying washing machines for over 40 years and been pretty unhappy with the models the last 15 years or so. I know what I want the washer to do - I do NOT need it to figure things out. I even sold one on Craig's list for a loss because I couldn't get it to do what I wanted. This one is like the old school ones. Stainless tub, center agitator, variable water levels. I am in control, not the pre-programs. I would never hesitate to recommend this washer. Rated 4 out of 5 by TnHnBnAnRW from Overall Great Value I purchased this washer back in December. So far, I am very pleased with the overall performace. We had some intial performance issues, however after a very informative phone call with customer service, it was determined that the issue was due to the 3rd Party technician who installed it. The GE representative still sent me a kit, free of charge, to make sure that the issue was solved, which it was. After those issues were addressed, the dryer has worked well. I have noticed that with large loads (i.e. bedding, or just a heavy blanket) will require a second run through, usually just another 30 minutes or so. That is probably the only reason I gave it a 4/5. I have a young child, so being able to turn off the finsh buzzer is a huge plus. This is a fairly simple dryer, which was perfect, considering we don't have any needs for anything special, so the simplicity of the controls and options are very beneficial.